Tired of the dark grey winter mornings? Desperate for some sunshine and scuba dives? Planning to make a new years resolution to dive more? Planning to take your next level of PADI Course? We are here to help! 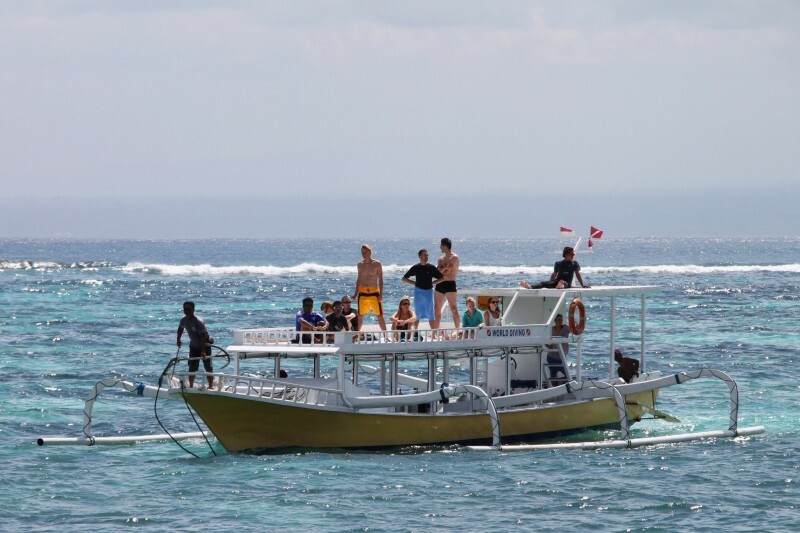 Dive with World Diving Lembongan during February and March and we’ll give you an instant 10% discount! 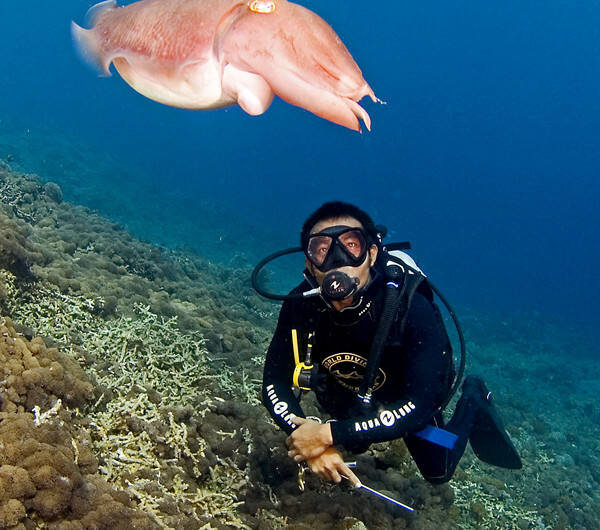 That’s right, we are offering 10% discount on our daily dive trips, dive and stay packages and PADI courses. 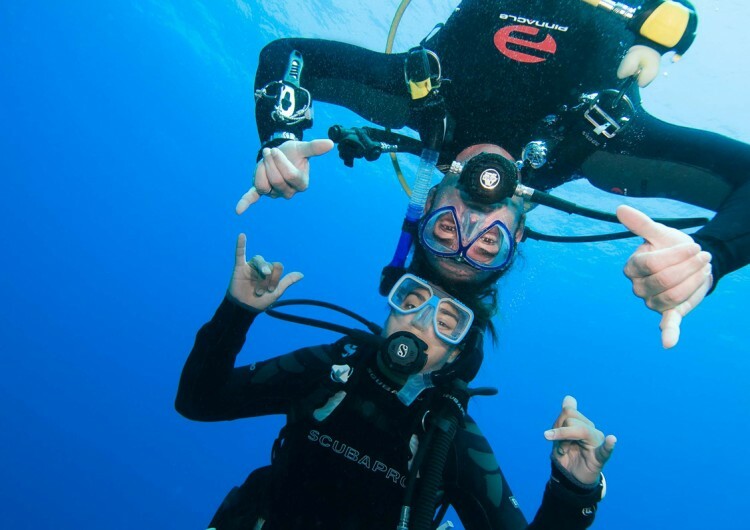 There is no better time to dive with us than through the winter! 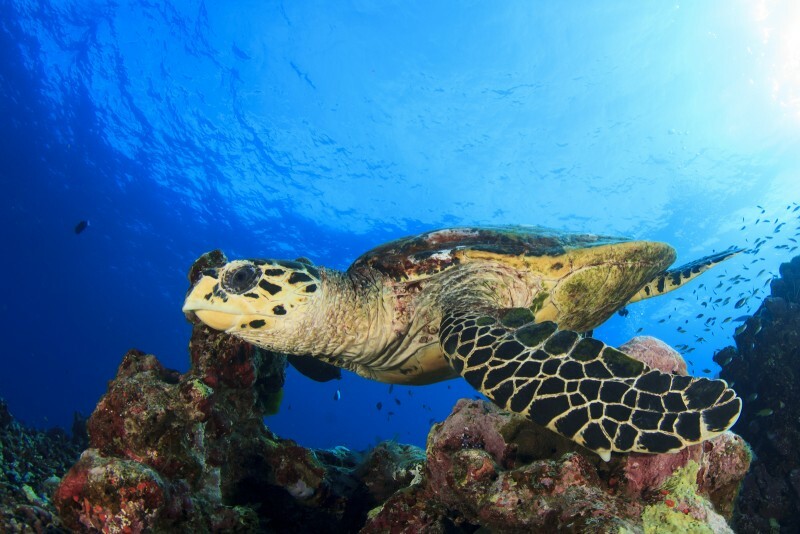 Did you know this is also when the water temperature is at its warmest and the dive sites are quieter meaning incredible marine life encounters without other divers! 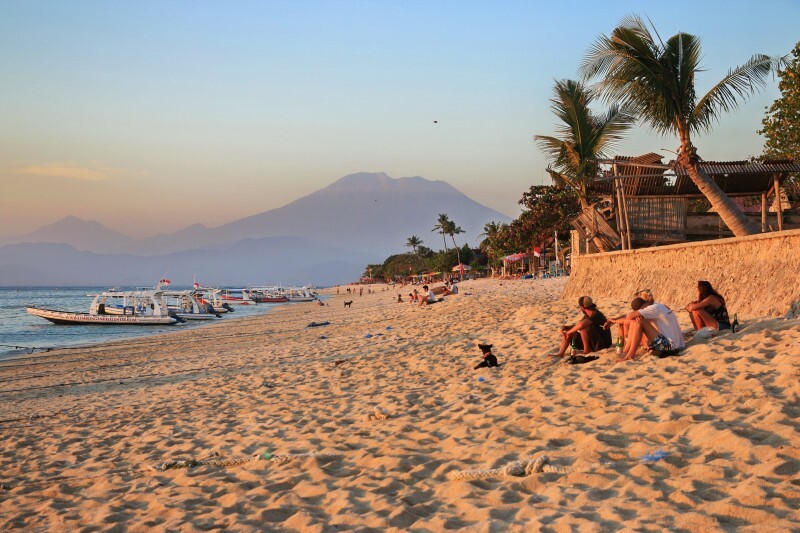 Are you an Indonesian National or expat living in Indonesia? Combine your WNI / KITAS 10% discount with our winter savings discount for a massive 20% off trips, courses and packages! 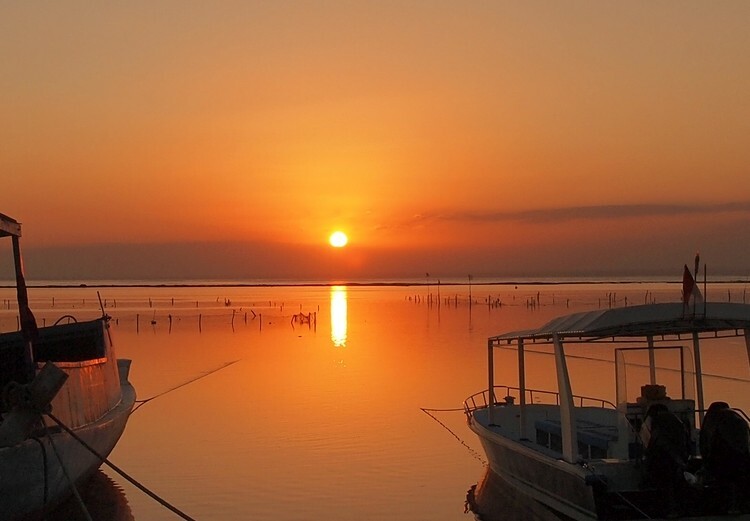 See you soon in sunny Nusa Lembongan. By now you have your weights correctly adjusted and you can operate your BCD without replicating a polaris missile but your legs keep sinking and you end up rolling onto your back like a stranded turtle. This is where trim comes in. It’s all about weights again. But this time it is the where that is important. A couple of physiological facts. Men have heavy legs. Older women have legs that float. This will obviously affect the angle in which you attain when you are neutrally buoyant. You want your body to be as horizontal as possible so here are some tricks to help. If you are finding that your legs are always sinking, put one of your weights onto the tank band. A weight will hold fine if you thread it onto the band after you have secured your BCD. The Velcro on the band will hold everything firmly. If you are investing in a BCD, then look for one with trim pockets. These are normally mounted on the back about level with the tank band. Another solution is to have the BCD mounted slightly lower down the tank, but this does result in a few collisions between your head and the regulator. On the other hand, if your legs are reaching for the sky, ankle weights are a solution. These can be the training weights for joggers that you can buy from sport shops. Alternatively you can buy heavy fins. The old style jet fins made from black rubber are great for this! What about always rolling over? Think about boats. These are stable when all of the weight is down in the bottom of the boat. Look how you have your weights distributed on your weight belt. If you have them arranged so that they are positioned either side of the buckle on your front then that is ideal. If you have an odd number, then put the single weight on your tank band. A lot of these issues can be sorted by buying good equipment. A weight integrated BCD puts the weights exactly where they should be and generally come with trim pockets too. Final floaty bits that can upset the apple cart. There is one more item that affects your buoyancy and that is your exposure protection. Wetsuits float, thick wetsuits float a lot and dry suits really float. All of these items are affected by pressure too. The deeper you go, the more they compress. A number of our guests comment that they find getting neutral in our wetsuits harded than when they did their open water course. That’s because we use 5mm full suits and they trained in 2.5 mm shorties. With a thick wetsuit you have to be a lot more proactive in maintaining your buoyancy. Expect to add a lot more air to your BCD when descending and remember to let this extra air out on the way back up. Finally, don’t forget that empty tanks float too! Well not really wind but trapped air. Similar really and pretty problematic! No one wants trapped air! Last month the mystical Art of Buoyancy Control was looking at the sinky bits. This month we are looking at the floaty bits, so let’s start by having a look at the main floaty bit. The BCD. BCD also known as a Stab Jacket! 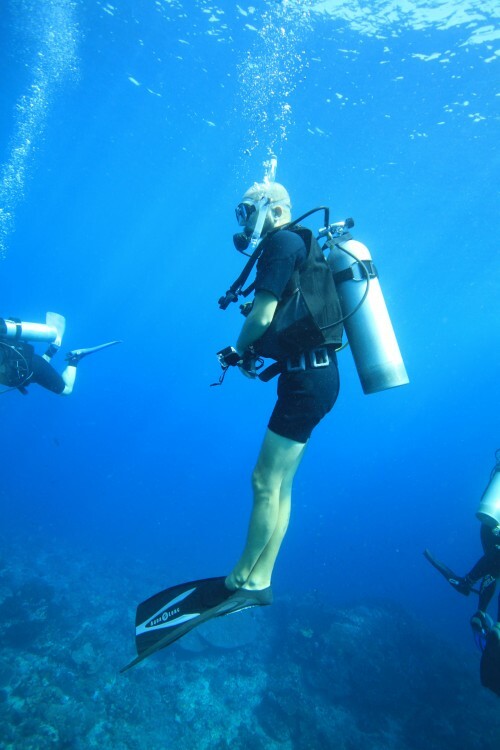 The BCD is your main way of changing your state of buoyancy. Remember back to those Open Water lessons? Positively Buoyant, good for hanging loose on the surface and having pre and post dive chats. Negatively Buoyant, the way to go down…. And then that mystical state. Neutrally Buoyant, the condition your dive guide seems to attain with no visible effort while you are still using the inflator hose like a demented bag pipe strangler! The thing to remember about air is that it loves to float. So it will always rise to the highest point (the point closest to the surface) of your BCD. This means that air can get trapped in all sorts of silly nooks and crannies. BCD manufacturers have recognised this and have put dump valves and the deflator hose in appropriate places. The standard way releasing air from the jacket is to raise the deflator hose and the left shoulder so it becomes the point closest to the surface and then let out the air. Sometimes water has got into this hose so keep the deflator button depressed until you see or hear the air coming out. This can take a few seconds. If you are swimming horizontally, roll so that you left hand side is upmost and point the deflator toward the surface. What about dumps? Most BCDs now have dump valves on the right shoulder and the right lower corner of the jacket. These are quick ways of getting that air out and loose buoyancy. If you want to dump then you must make sure that the valve is at the high point, i.e. closest to the surface. I have seen a number of divers attempting to use the bottom dump valve when in a head up position. The only way you can use this valve is in a head down position as when you are duck diving. Trapped air? Yes this can happen but it is minimised by having a correctly fitting jacket with all the buckles and clips correctly adjusted and clipped up. This keeps the BCD in the best position for air to easily find its way out. The best way of getting rid of trapped air is to get your body into a head up position. Raise the deflator, left shoulder high and be patient. Squeezing the BCD with your elbows will not do much except make you look like you are doing the funky chicken at some strange northern night club! So you’ve successfully descended, you have the right weights and your trapped wind problems are sorted. How do you get the buoyancy just right? The secret is in the word adjustment. With the right amount of weight on, it should not take that much air in your BCD to become neutral. As you descend, add small amounts of air every five metres or so. That will compensate for the compression of the air still in your BCD. While you are still getting to grips with it, get upright, find a visual reference, a bit of reef, a point on the shot or anchor line, but please, not a fish! With this reference keep adding small amounts of air until you can stay level with your reference. Remember….keep breathing! If you find yourself floating up, let out small amounts of air and breath out all the way. Don’t dump all of the air unless you are imitating a Polaris missile. If you do you will have to start the process all over again. Also remember that it takes time for the adjustments to take effect, inertia is a very powerful force and with all of your gear on you have a mass of around 100 kilos, so adding half a kilo of lift is not a big force. So be patient. Make your changes and then wait a few breaths. As you go deeper you will need to add air to your jacket. There are other floaty bits that start to affect things at this stage but more of that in the next thrilling blog! So you have plunged the depths and are now heading away from the wonders of the deep. As you head up, all that air that you put into the BCD will start to expand as the pressure around you gets less. It is important to release a little bit of that air as you come up. As a starting point, make your ascent the same way as you went down, five metres at a time and then adjust your buoyancy again. You will soon get into the habit of automatically adding or letting air out of the jacket as you head down or go up. From this point on it is practice makes perfect. Next month we will look at your other floaty bits and get you in trim! Or How to Hover Like Guru! Part 1 – Shake the Lead Out! We have all been there. You’ve made your pre-dive checks, jacket – check, lead weights – check, releases – check, air – check, final O.K and your in the water. The dive begins and, just like our instructor told us, you let just enough air out of the Buoyancy Control Device, breath out and slowly sink into azure underwater world to glide effortlessly among the fish. The reality is more like, let the air out of the Blasted Crappy Device and stay glued to the surface, or even more dramatically, trigger a roller coaster ride of ups and downs, inflates, deflates, hard finning to get down or flapping like a demented butterfly just to stop from sinking. Forget protecting delicate underwater life, all you want to do is stop yourself from becoming an addition to Davey Jones’ locker! So how do the pros make it all look so easy? Of all the skills that we learn in our PADI Open Water Course, buoyancy Control is the most dynamic. There are so many factors that affect your positioning in the water; your wetsuit, your weights, your lung volume, the water you are diving in, the amount of air in your tank, what your tank is made from and not forgetting that Blasted Crappy Device! Let’s look at weights first. This is probably the most misunderstood item of equipment. The amount of weight you need is just enough to counter the buoyancy of you, your wetsuit, the water that you are diving in and your tank when it is down to about 50 bar. Anything extra will just make life so much more difficult. When you are correctly weighted you will be negatively buoyant at the beginning of the dive and neutrally buoyant at the end. 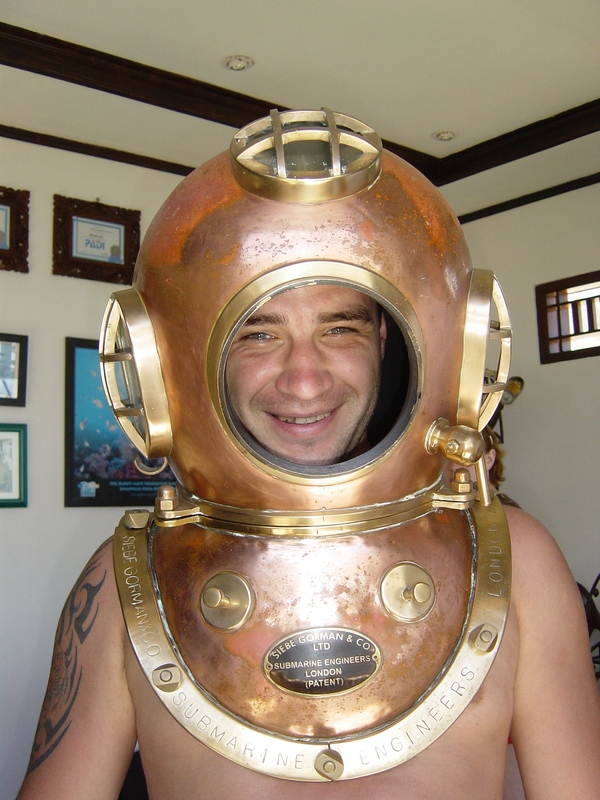 There is no typical amount of weight and the lead that you had on your dive in the Cayman Islands in a 3 mm shorty will not be the same as those that you need doing retro hard hat dive off Grimsby docks! How to get the right amount of lead! So, how do you go about making sure you have the correct amount of weight? First of all, just before you make your descent do a buoyancy check. With all of your gear in place and your regulator in your mouth, hang motionless in the water. That means no kicking! Next let all the air out of your jacket and take a good breath in. You should now find that you are floating at eye level. Now breathe out and you should slowly start to sink. If you are still floating, add a kilo and repeat the check. If you sink like a stone, remove a kilo and repeat. Finally, add one or two kilos to take care of tank buoyancy at the end of your dive. If you are using a steel tank you don’t need this last step. Next, have a think about what is happening on your dives. Floating around on the surface like a bobbing cork is the obvious sign that a couple of kilos extra would not go amiss, as is that exciting head down, arse up and legs kicking position while trying to do your safety stop,( though that could be to do with trapped air. More about wind problems in the next thrilling instalment!) However, if you find yourself dropping like an abandoned anchor, that would suggest a weight loss progamme would be beneficial. Get rid of the pounds! Another more subtle sign of overweighting is having to constantly add and release air from your BCD. It does not seem to matter what you do, as soon as you start to swim you lose control and start the porpoise ride all over again. The reason is simple. Excess kilos on your belt means more air in your BCD, so any change in depth will mean that this air expands or contracts a lot and this has a big effect on your buoyancy. The less air you have in your jacket then the less effect it has on you when you change depth. Get rid of the extra weights and you get rid of the extra air. The simple answer to this is Bintang! Yes that delicious cold libation readily available on Lembongan that instigates all sorts of crazy ideas that you have completely forgotten about in the morning. “What Next?” but at this stage in our lives we were not looking to make any changes. Life was good. We had family over to visit and they were divers, so we made a plan to take them to our favourite spot in Bali, Nusa Lembongan. Previously we had developed a great relationship with Mark and Shirley , the owners of a little place called World Diving Lembongan, so every trip was now to this dive centre. We knew that they would take us to great dive sites with manta rays, fantastic reefs, a great dive boat and reliable divemasters. So without hesitation I went to their website and made a booking. 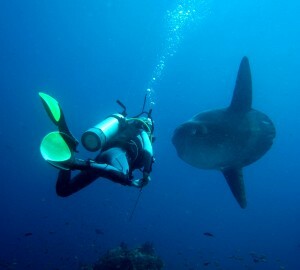 We had a fabulous time and dived for several days showing our guests the very best of Bali diving. 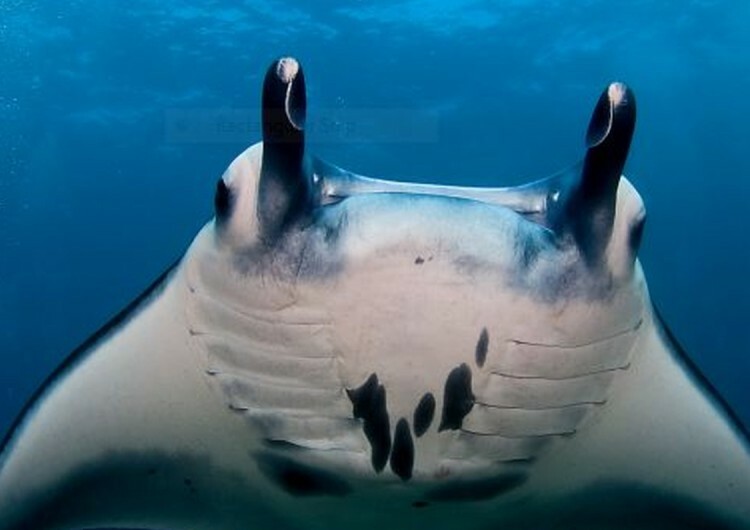 Our last day we had a double whammy, mantas everywhere at Manta Point and then a mola all to ourselves in Crystal bay. We were ecstatic, and invited our hosts to dinner. And so to the Bintang moment. We all laughed and chuckled at the idea and after a few more Bintangs, the whole concept faded into oblivion. So we thought. A Word on Masks -Which mask suits you sir? There you are, a newly fledged PADI Open Water Diver, and you start looking at all the wonderful stuff you can now buy to go with that shiny new C-card. So what is and is not worth buying? The first thing I would consider are masks. There is nothing more frustrating than having a mask that leaks and there is nothing more repellent than a mask full of mould that with fraying straps and raggedy seals. For masks, comfort and a good fit is important! As I said in the article about wetsuits, the most important thing about any equipment is a good fit. Your mask has to be comfortable as you are going to have this thing on your face for at least an hour. Masks come in all sorts of shapes and sizes so the first thing to do is find masks that are the right width for your face. This may even mean trying on masks for children if you have a particularly narrow face. Then you need to do the fit test. Without using the strap, put the mask against you face and sniff! You should find that the mask sticks to your face like a demented limpet and holds itself in place. Guys with beards may find this will not happen. Unfortunately air can get back into the mask via your 6 o’clock shadow! Now that you have seen that the mask fits, just push it against you face a little more firmly and see if there are any parts of the mask that feels uncomfortable. Remember, water pressure can make the mask fit tighter. I find that certain makes have a hard plastic frame that pushes against the bridge of my nose. After wearing one of these masks for a day I actually had a bruise where the mask had been pressing on my face. On another occasion, one guest had the firm imprint of a screw head at the end of her nose. This was where the drain valve of her mask was making contact! Next is the style of mask. There are so many options out there, but you are ideally looking for a low volume mask. That is a mask that does not have too much air space on the inside. These are generally easier to clear. If you need corrective lenses, you will need to look for a twin lensed mask like the Technisub LOOK. 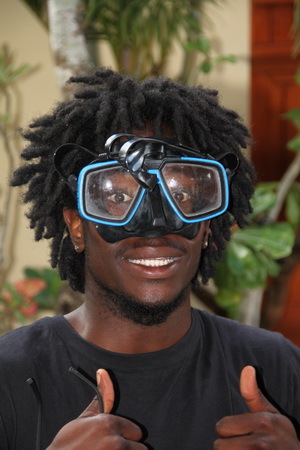 You can buy the corrective lenses for this mask and have the dive shop fit them for you. The mask sniff test in action! After all this you can now go about selecting the colour so that it synchronises with your beach wear! As most wetsuits are black, I decided that this would be my colour of choice, but I am an old traditionalist. One thing about skirts….. the one on the mask! If you are a keen photographer, a black silicone material is better as this reduces glare inside the mask and makes it easier to see the screen of your camera. So there you have it, fit and comfort, no funny screws and a dark skirt. What could be clearer? A Word On Wetsuits or how to fit into tight rubber! Wetsuits. Rubber Straight Jacket or Sleek Dive Wear? Ok, so you have arrived at the dive shop and it is time to try on your equipment. Most things go on pretty easily, boots, BCD, mask and fins just slip on, no fuss. Then there are the wetsuits! At this stage your inner contortionist comes into play, nails splinter, knuckles get bruised and potential hernias pop! Meanwhile, your divemaster or instructor just seems to glide seamlessly into their rubber straight jacket without even breaking sweat, goes off for a cup of tea, has a chat, answers a few emails and yet your wretched suit still has not got over your knees! How do they manage to do this I hear you ask. Which wetsuits are right for you? The first thing is to have a suit that is the right fit. Strange it may seem but men and women do not have the same body shape. Men’s wetsuits are more generous in the shoulders and women’s wetsuits are more generous in the hips. If your dive shop has both male and female suits then you are very lucky indeed! Suits are generally sized from XXS to XXL and will stretch to accommodate a wide variety of height and width fittings. However, there is a limit to how much they will stretch! You want the fit to be comfortable but snug. Remember, the idea is to trap a little bit of water inside the suit and then have your body warm that water. If you have a bath full of water swilling around on the inside of your suit, then you ain’t going to warm it up, likewise, if you have huge gaps at your neck, wrists and ankles, then all that warm water will wash away! You have found what you think is the correct size for you, so how can you glide into you rental suit like a pro? Solution one is plastic bags. Place a bag over your foot before sliding into the leg of your wetsuit and you will find that your foot does not snag half way through the foot hole. The same with your hands going into the sleeves of the suit. Solution two is to carry a bottle of shampoo or conditioner with you. 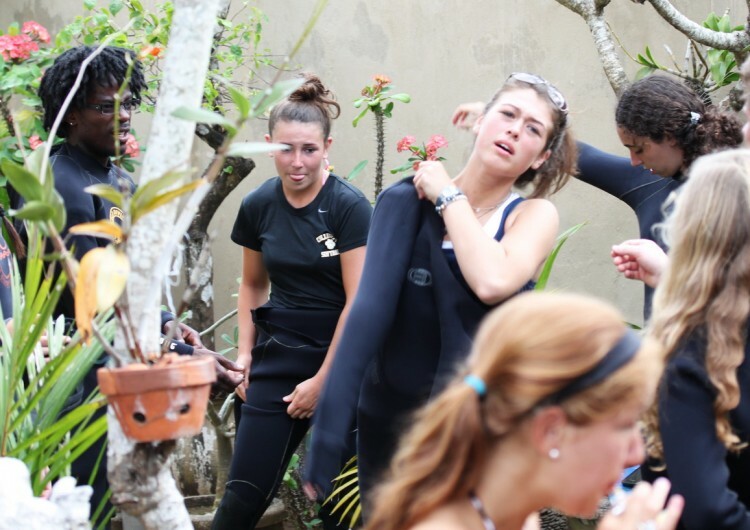 Lather yourself up all over your arms and legs with shampoo or conditioner, wet the inside of the wet suit and you will find that the suit slips on like a second skin. If you wish to remain friends with your dive shop, do not use sun tan lotion or oil. This trashes the wet suit in next to no time. Third, try to pinch the wetsuit with your thumb and fingers rather than grabbing a fist full of neoprene and tugging like a person possessed. This will save your nails and knuckles. Ease the suit up a little bit at a time. Finally, get your buddy to help. They can ease the suit over shoulders and also help pull up the zip. Tears form in divemasters eyes as they watch divers playing tug o’ war with wetsuit zip cords, just waiting for the inevitable ripping sound as the zipper pulls away! 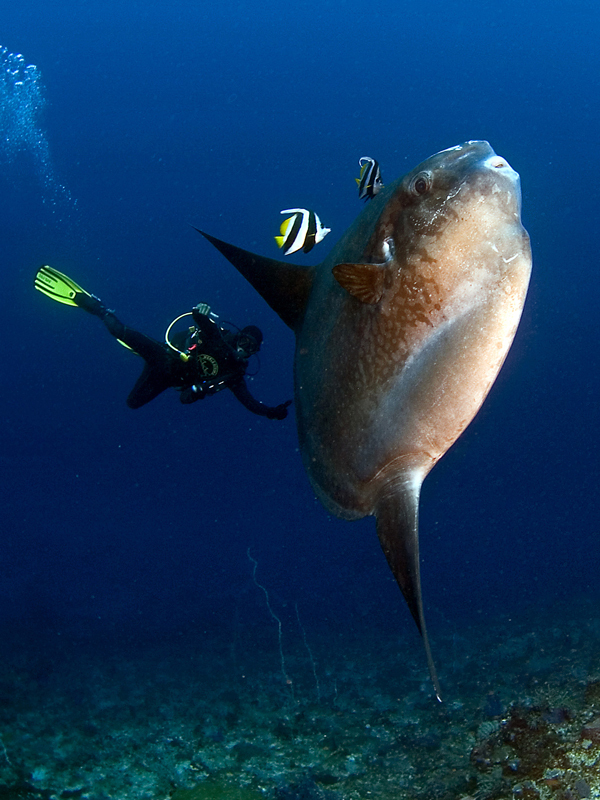 The mighty Mola (Oceanic sunfish) is one of the reasons why our islands and our dive sites are so famous. The sunfish is one of the strangest looking fish in the ocean and yet one that divers often place highly on their lists of ‘things to see’. As the heaviest known bony fish in the world and weighing in at over 2,200lbs the mola has two dorsal fins making it as tall as it is long. 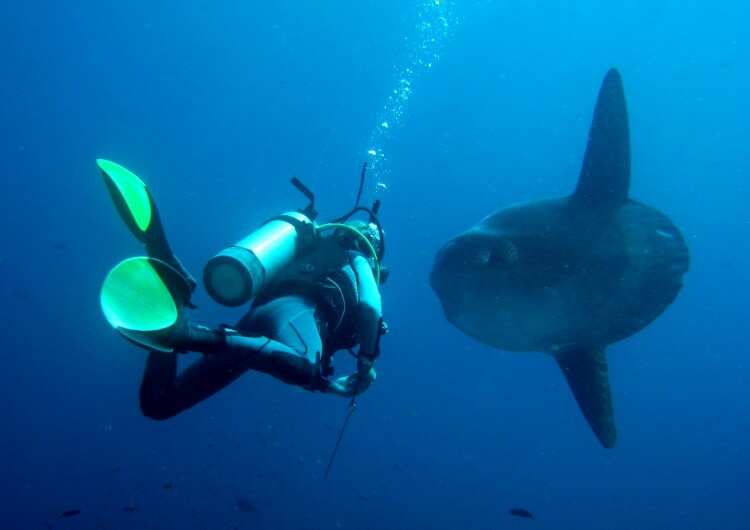 The most distinguishing feature of the mola is its main body area – of which there is very little – and which is flattened laterally. This strange shaping explains the German name for the fish – ‘schwimmender kopf’ which translates literally to ‘swimming head’. The word ‘mola’ is actually latin and means ‘millstone’ perhaps referring to either the shape or marbled coloration of the fish which is very typical in the Ramsayi species commonly seen around Nusa Penida. Sunfish live on a diet of nutritionally poor jelly fish and to maintain their body weight they consume huge quantities. Ordinarily they are deep water fish but they are seen around Nusa Penida from July to October as they drift up the reefs on the cold thermoclines making their way into the shallower waters. Year round they carry an incredibly heavy parasitic load and these giant fish rely on some of the reefs smallest inhabitants to unburden them through cleaning. Mola cleaning is an incredible sight as this huge fish, which averages around 2 meters, cruises up the reef hoping to attract the attention of the smaller reef fish. Banner fish are one of the great mola cleaning fish and can be seen literally leaving the reef in swarms as they flock to the mola. Other cleaner fish include cleaner wrasse which primarily clean around the gills and mouth, butterfly fish which focus on the eyes and even emperor angel fish have been seen cleaning the dorsal fins. Another means by which the mola is thought to rid itself of parasites is by ‘jumping’ – a phenomenon often witnessed by fishermen and during surface intervals. The mola will break through the surface and then crash back down creating an almighty splash which is thought to break off parasites in the process. They are a truly Jurassic looking fish which, as a member of the order Tetraodontiformes, are closely related to pufferfish, porcupine fish and triggerfish. The sunfish is also referred to as the Balinese Sunfish (or Moonfish to the French – Poisson Lune). The name sunfish is thought to come from its habit of ‘sunbathing’ on the surface of the water.